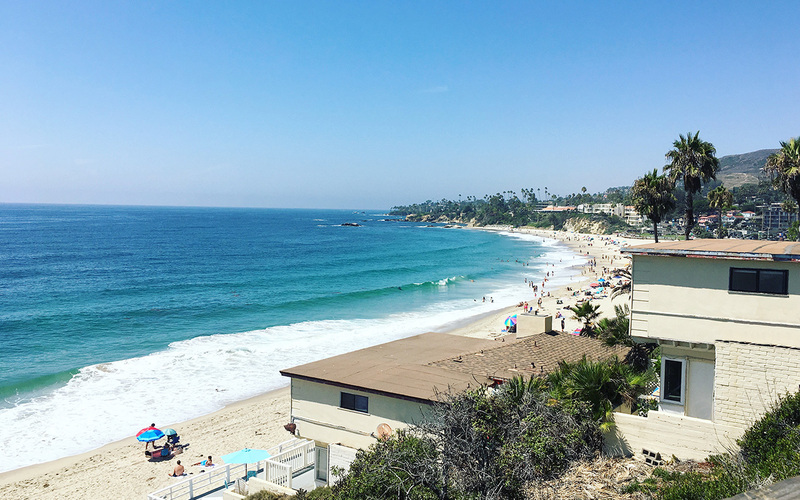 This is Brown’s Park in downtown North Laguna Beach. 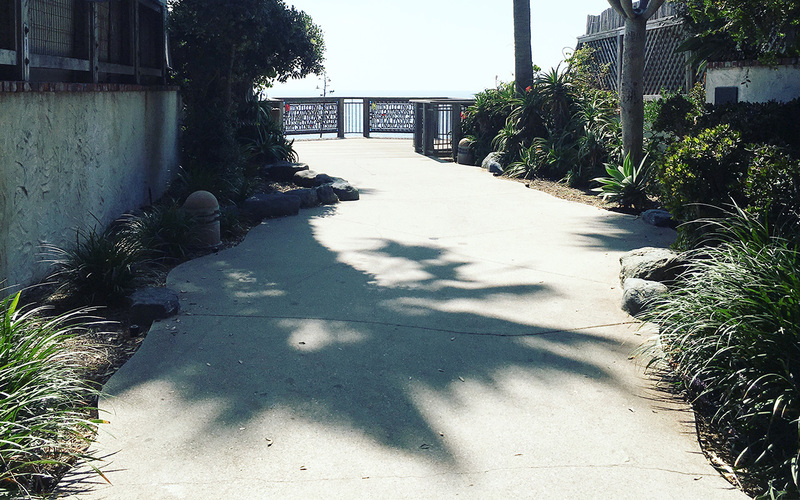 It is an enchanting oasis tucked somewhere between Wyland Galleries and The Cliff Restaurant. It is easily missed if you’re not paying attention and a pleasant surprise if you chance upon it unexpectedly. It offers another welcome break from the busy Pacific Coast Highway which is what this lady sitting on the flat-top boulder is doing, I suppose. 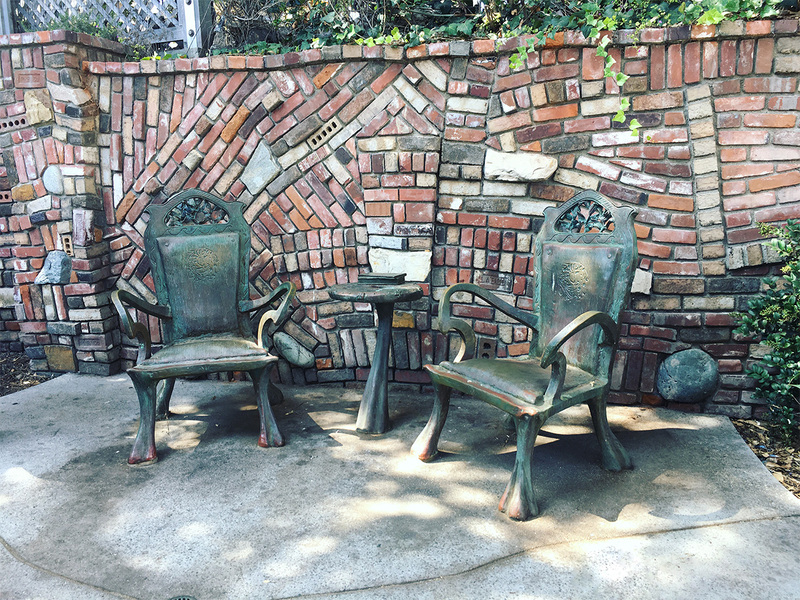 As you enter Brown’s Park, you’ll notice these bronze sculptures of a table, book, and two chairs. Seeing this, you get a sense that there is something special and playful about this place. Some of the things I look out for when I go exploring are interesting patterns and textures. 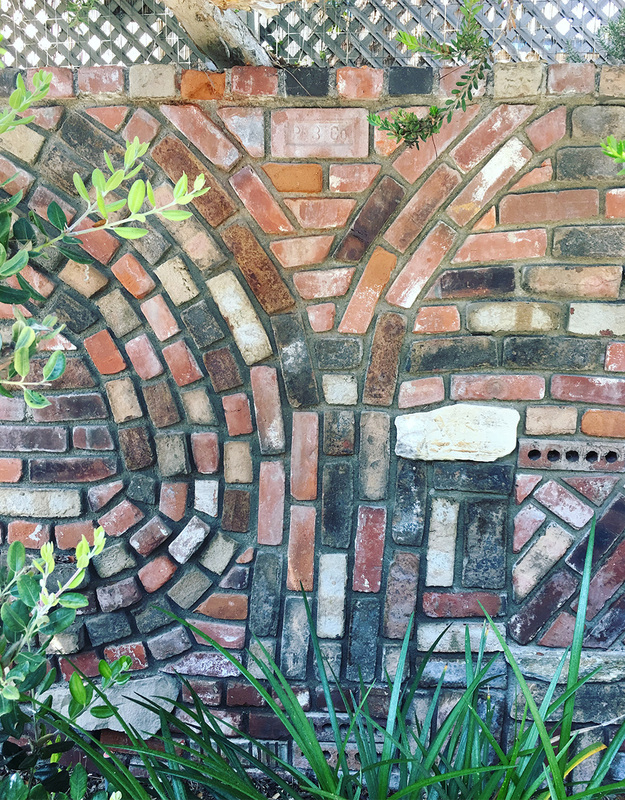 So how about this brick wall that borders Brown’s Park? 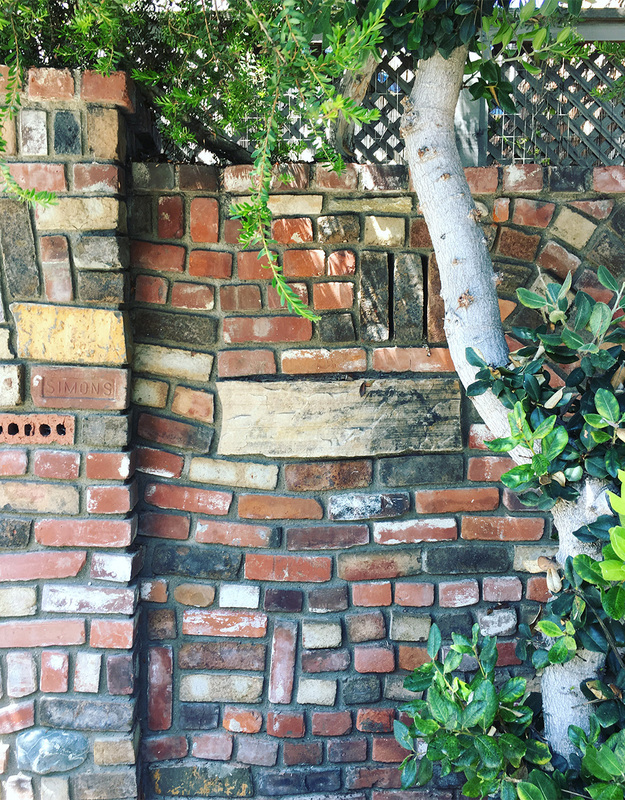 I love everything about it – the distressed colors that complement the foliage perfectly, the playfully peculiar pattern/layout of the bricks, even its juxtaposition with the cross-hatched wooden fence above. 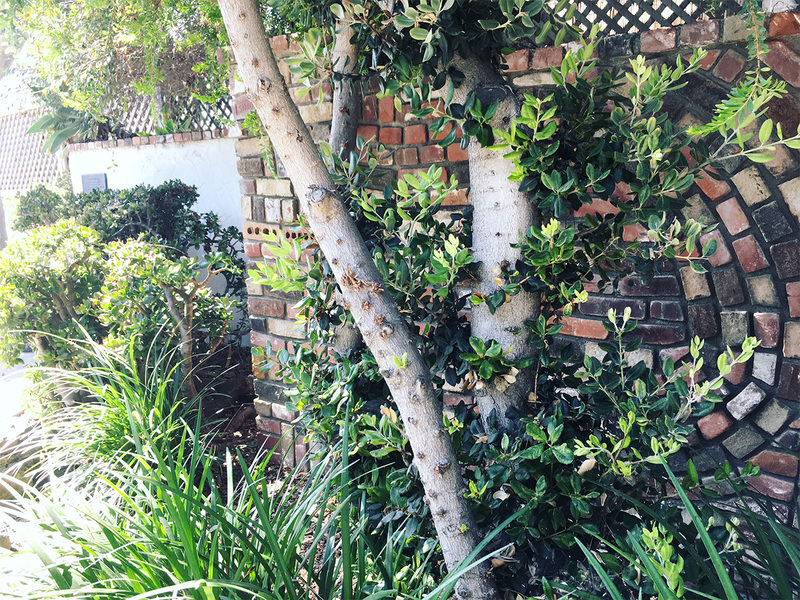 The whimsical character of both this brick wall and the sculptures plus the refreshing, vibrant colors of the surrounding plants give this area, in my opinion, a fairytale-like atmosphere. Brown’s Park culminates in a view deck that offers a magnificent view of Main Beach. 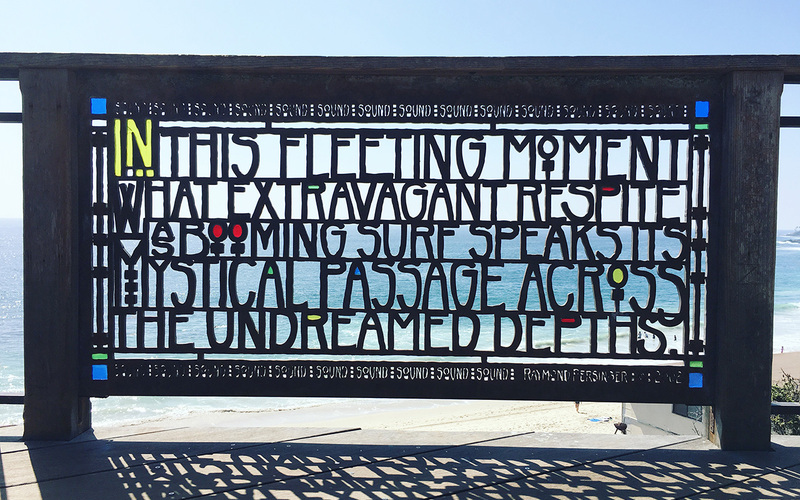 In my experience, it is never thronged with people so it is a great place to linger awhile and contemplate on life and the universe while you stare at the vastness of the ocean and enjoy the salty sea air. 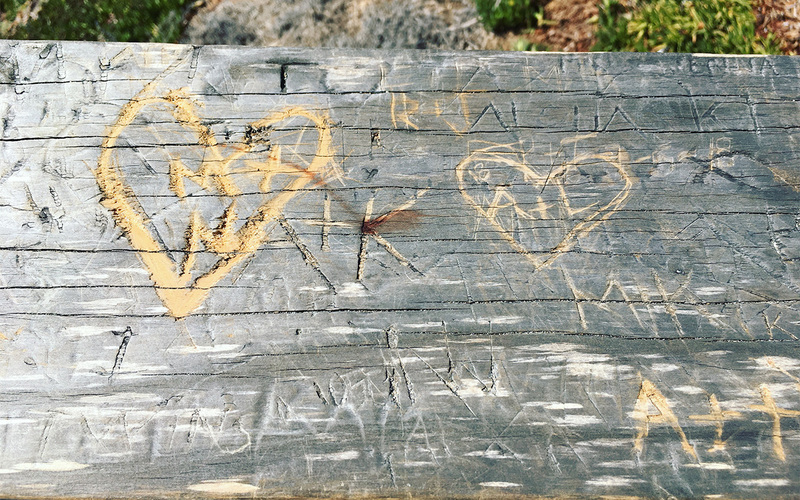 If you observe close enough, you’ll see graffiti carvings on the top wooden rail – professions of eternal love, proof of mundane existence, or just plain vandalism. Equally magical as this seemingly unassuming place is its history. The story goes that a businessman named Charles Bergfeldt bought a 2-storey house on this spot in the 1930s. This house, which the family enjoyed for generations, was destroyed by the El Nino storm that hit the coast in 1998. 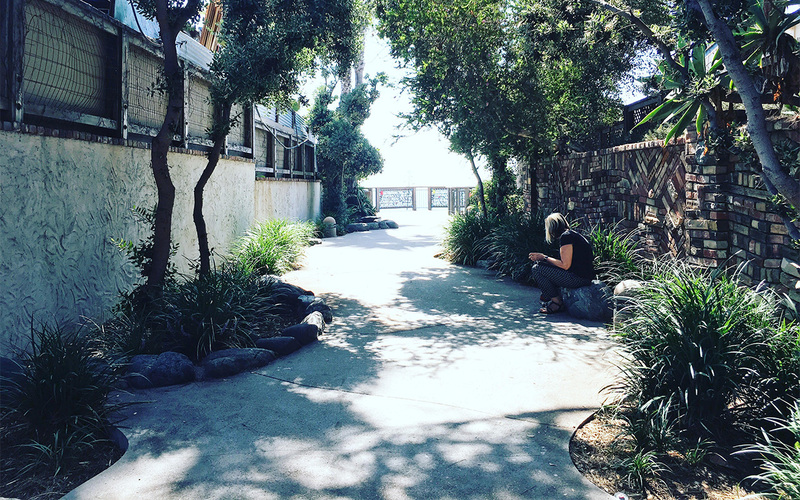 Instead of rebuilding the house, Joe Brown, its current steward and the grandson of Charles Bergfeldt, decided to donate the land to the city so that it may be transformed into a small public park where anyone can enjoy the ocean views that it offers. What a remarkable story! He could easily have sold the prime seaside property for millions of dollars. Instead, he generously shared it with the public. The park opened in 2002.